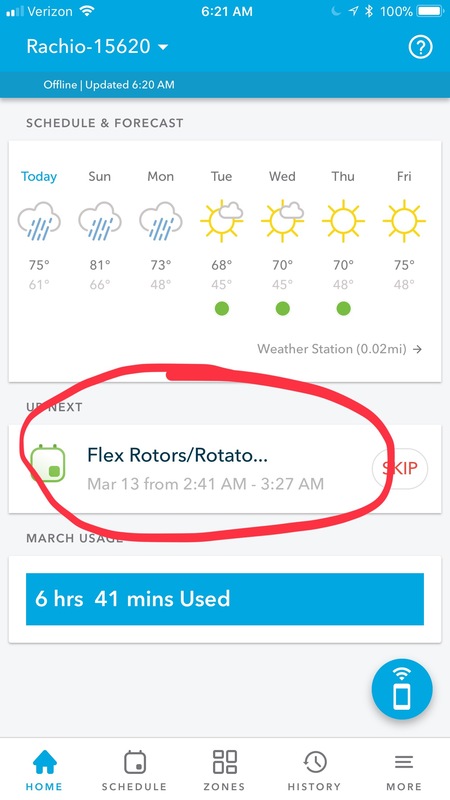 I just installed my Rachio v3 and tried to change the schedule timing to “finish before sunrise”. 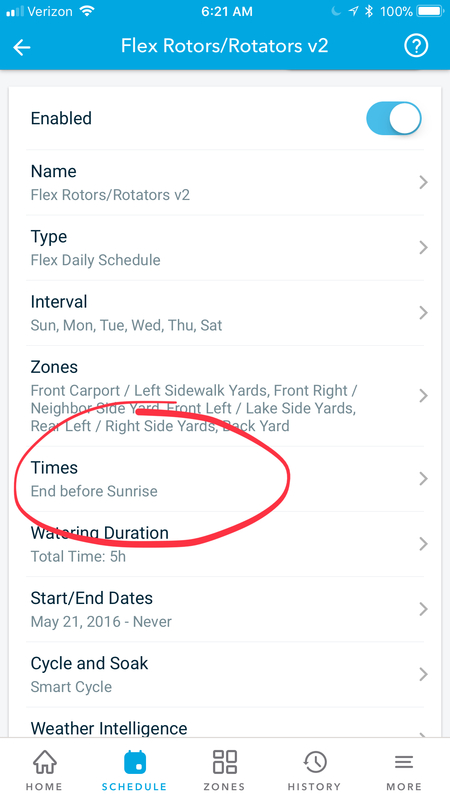 For some reason, the app created a schedule that starts at 7:15pm and runs until 2:16am, when sunrise isn’t until 5:40am. I’m in San Diego, so I thought that it might be a problem with time zones, but even pretending that it’s using the EDT sunrise time doesn’t make sense. Why isn’t it trying to end closer to sunrise? It takes into account the time for all zones in a schedule to run and backs that off the 5:40am time. If not all zones are scheduled, it still starts at the same time, but finishes early. Thanks @tmcgahey… I had the same question! Not a fan of how that works, though. 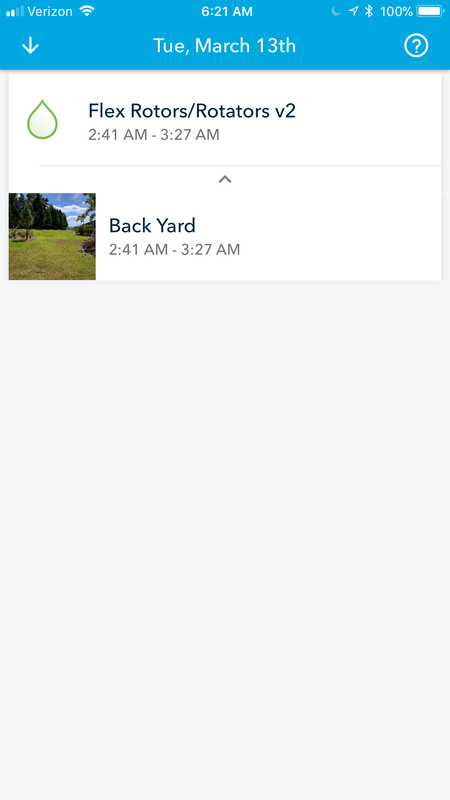 I understand it having to start at 2:00AM on the rare days that all of my zones need to run (to be done by 6:45AM when we let the dogs out), but starting at 2:00AM EVERY DAY seems crazy, and now makes me worry about getting brown patch disease on my tall fescue lawn. Yeah, not a fan. I may go back to ‘start at 5am’ to avoid it staring during dinnertime the evening before. It’s still light out at 7:15! It clearly knows how much it plans to water and for how long, so blindly assuming the maximum runtime is weird. I would argue that this functionality is just broken. It’s the same problem with End by time X. The start time should vary, not the end time. It’s too bad, it’s could be a really useful feature. We are aware that it’s not ideal, actually a fairly difficult problem to solve for various reasons. Thanks, @franz. I concur with most of the sentiments on that thread, particularly with the last guy whose watering starts in mid-afternoon with the current algorithm. I’m going to switch to a fixed start time and monitor for any changes to “before sunrise”.